Incidentally, I am making broad assumptions as to the nature of running a marathon. I am not in any kind of physical shape to do more than watch a marathon on television, provided I take frequent pauses to catch my breath. I often remind myself – with substantial self-loathing – that if I did a better job of resembling an actual marathoner, I would not need to take occasional stops on a bench or second laps around the park on the Disneyland Railroad to rest aching feet. I plan a lot of exercise programs in the Toy Story Mania queue. Mornings and evenings at the Disneyland Resort in mid-October are usually pleasant, with the slightest touch of briskness, and taken well in shirtsleeves. We had been excited about this, but our weather for the week had been a disappointing extension of summer, with daytime highs well into the 90s. The morning of October 18th was like turning on the oven and immediately sticking your head inside. It wasn’t too bad at the moment, but you just knew it was going to get worse. It was that same morning, our seventh day, that my brother, Jake, sister-in-law, Valerie, and their daughter, Jorja, left for home. My dad drove them to the Long Beach airport in the morning, and with that, we saw the first unraveling threads of our coalition. Amy and I spent our first several hours in Disney California Adventure (DCA) with the Duffins – Amy’s sister, brother-in-law, and their family – as it would be their last day in the parks. We were losing two of our core groups that day, and soon it would be our turn, but we were not quite ready to tackle that yet. Although the Duffin family was vacationing at the Disneyland Resort for the first time, they had jumped in with both feet and already had a good feel for the place. 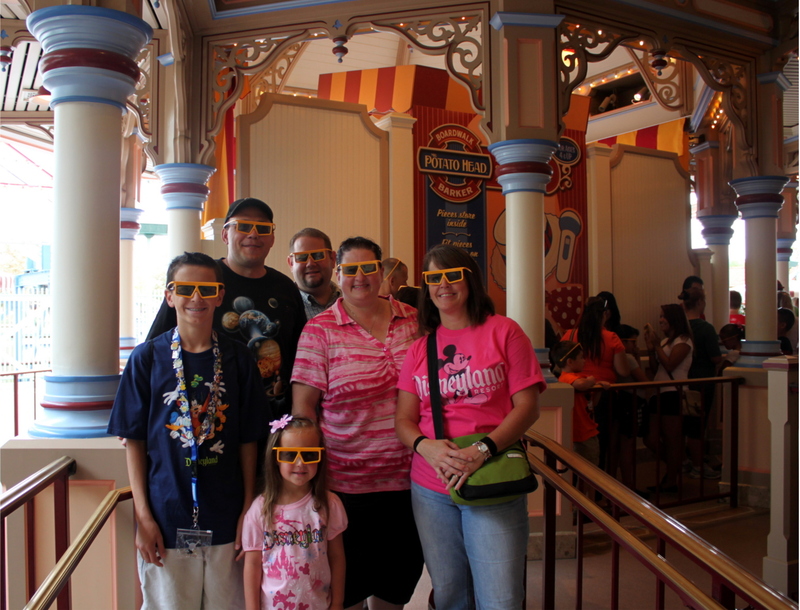 Julianne – the materfamilias – wanted to see World of Color that evening for their closing experience in the parks. This sounded good to Amy, as well, so while the group walked over to ride Toy Story Mania, I volunteered to be the concierge and powered through a loop around the other end of DCA to pick up FastPasses for that evening’s show, which were distributed at the Grizzly River Run FastPass area. As an added bonus, the 3D glasses are smashing. Amy and the Duffins walked on Toy Story Mania, without having to wait in a line. This was unheard of for us, as it only happens first thing in the morning, when we are usually snoozing our alarms. The group was just exiting the ride through the merchandise location when I got there, and as the line was still very short, we ran on again. Toy Story Mania (TSM) was the first major attraction to open after Disney announced their billion-dollar-plus expansion and revamp of DCA, and was a popular jam from the very first day. Riders pick up 3D glasses in the queue, board back-to-back cars, and zip between big game screens that are introduced by the characters of the Toy Story movies. Mounted to the front of the vehicle is a swiveling mini-cannon that “fires” into the screen by pulling a cord. This digital interaction is depicted as darts or rings or eggs, depending on the game. You get points based on the values shown on targets hit, which makes it a very good ride for friendly (or, in our case, competitive) wagering. Riders are not docked points for missing, so my strategy is to fire as often as possible, while trying to whirl the cannon at targets. I suspect this is the same strategy as 100% of the other players. 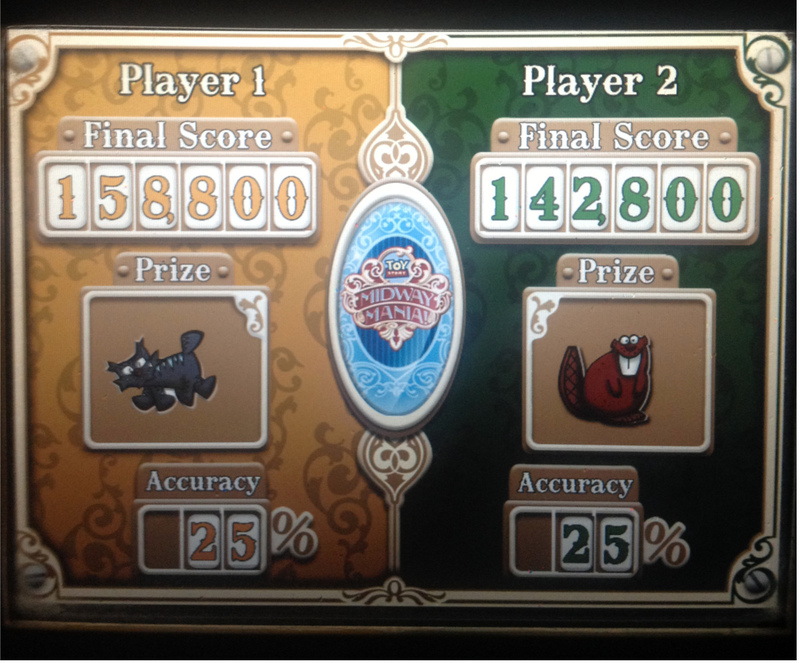 You would think these incredible scores are good enough for first place. You would be wrong. Riders sit side-by-side, so we split into a couple of teams as we got close, with me and Brennan – a talented up-and-comer in the league at 13 years old – pairing off to form a partnership. We talked the requisite trash to the other teams/family members, and boarded our vehicle prepared to dominate. We broke plates with eggs and stuck darts to mine cars and tossed rings around aliens at a level unheard of in the annals of Toy Story Mania. We were fearsome and overwhelming. At the end, when the dust settled and the scores were revealed, well, there were some tears shed, I can tell you that. Amy and Julianne (the winners) were even thoughtful enough to give us hugs and wipe away those tears. Afterward, we walked over to the appealing waterfront stretch adjacent to the Little Mermaid dark ride for a Duffin family photo. Group photography is a defining characteristic of Amy’s family, as anyone who knows them could tell you. Any time we gather (birthday, holiday, yard work, coincidence), Amy and her sisters feel strongly motivated to create a photographic record. Although I have expressed snarky comments and Olympic-caliber eye rolling over this constant shuttering, the truth is it has never actually bothered me (cue Amy spitting her beverage all over the screen). As we grow older, I have learned to appreciate the glimpse into the past that these records provide. * So, however inevitable this instance of the family photo may have been, it was also a lovely moment of the trip, capturing some of our very favorite people smiling and happy in one of our very favorite places. Family pictures are serious business for the Duffin clan. We finished the morning by walking to Soarin’ Over California before dad Joel took his two youngest sons for adventures and the older Duffin teenagers left to find something tolerable to do. Amy and I remained with Julianne, Brennan, and five-year-old Sarah, the youngest of our group. We poked our heads into a few shops and visited a few attractions in “a bug’s land” until lunch, when we were eager to introduce Pacific Wharf Café to our companions. I ordered the transcendent Santa Rosa Corn Chowder for the second time that week, and did not pay attention to what anyone else was having. We did the communal/family thing where we shared bites of our food with each other so everyone could taste more items. The more adult part of me agreed and shared, with what I hoped was a pleasant smile, although my impulse was to pull the bread bowl close to my chest and snarl like a feral dog. As afternoon set in, we decided to walk over to Disneyland so Julianne and Brennan could check Splash Mountain off their list. The FastPass return time was too late for our plans and the standby line was long, so Julianne and Brennan hopped in the Single Rider line while Amy and I took Sarah to look around. 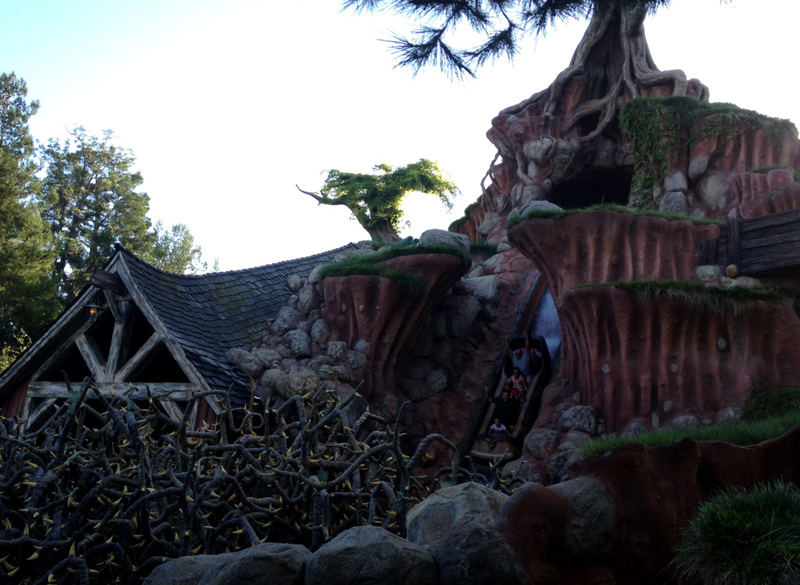 Julianne and Brennan loved it, and we were glad to hear it, but unsurprised: Splash Mountain is one of the best rides in the entire resort, after all. Besides that, it was boiling hot – maybe the hottest day we had yet, although it seemed that way each day – and wearing wet clothes would actually feel nice. Don’t let the clouds fool you. It just made the heat more deceptive. We had been through most of the stores at Disneyland and DCA already that trip, although not yet Pooh Corner, the store in Critter Country. At least, we had not gone through it in the sort of combing detail I would require to check it off from the Scrooge Quest. So, Amy, Sarah, and I meandered deeper into Critter Country while we waited for the riders. Pooh Corner is one of our favorites in the park, being in a relatively isolated spot and often with unique items that cannot be found in other places. Much of this distinction comes from the candy counter, where you can watch Cast Members creating decadent, delicious treats with chocolate, caramel, marshmallows, and other amazingly unhealthy ingredients. We recommend the Chocolate Covered Marshmallow Wand with Cashews; Pooh Corner is the only place to find it. We browsed the counter for a moment, resisting the urge to press our faces against the glass of the production area. 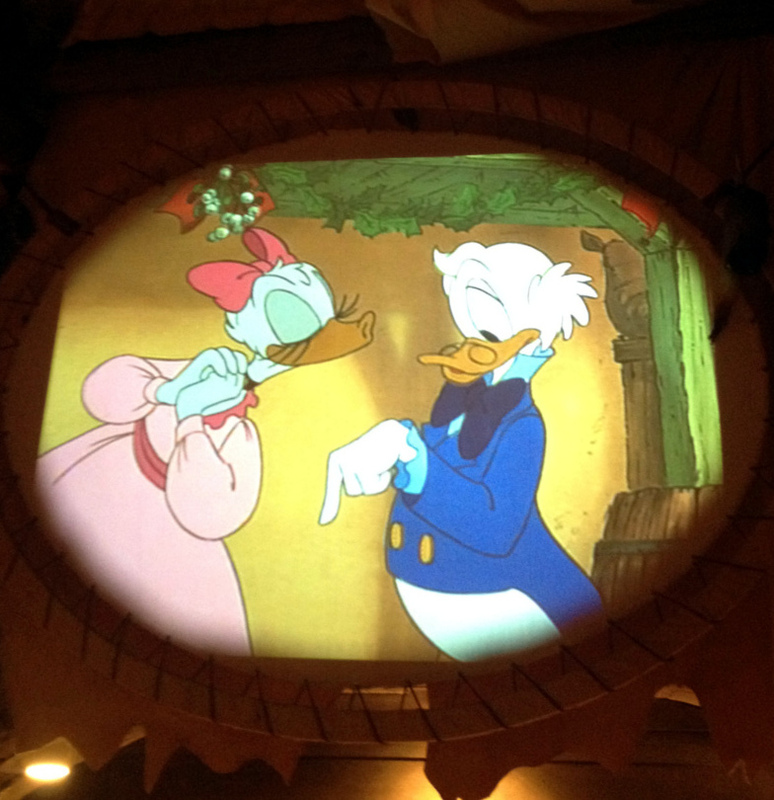 But, again, I was there for Scrooge McDuck. The Scrooge Quest is outlined in greater detail in other places on this website, but the short version is this: Scrooge McDuck is my favorite character, and I try to buy one new item with Scrooge represented on it during each trip to the Disney parks. I was 11-0 since I started the Scrooge Quest, years ago. I had never failed to find something new, but it was getting deeper into the vacation, and I had not found anything yet. I was starting to get a little nervous. Pooh Corner was a good place to look, though, because of their somewhat different selection. I knew better than to hope for a t-shirt or plush toy, those were reserved for the big time characters. The item I might find at this point in the hunt would be Scrooge included in a group of characters on a canister, or in a pack of miniature collectible figurines. Pins still probably represented my best chance at finding him. I moved through Pooh Corner with sharp focus and practiced hands. I was able to dismiss most merchandise at a glance, zeroing in on a few possibilities. The method was fast, but complete. We began at the candy counter end, and while Amy was walking around with Sarah, I raided the shelves like a prison guard tossing a cell. No Scrooge to be found a Pooh Corner. 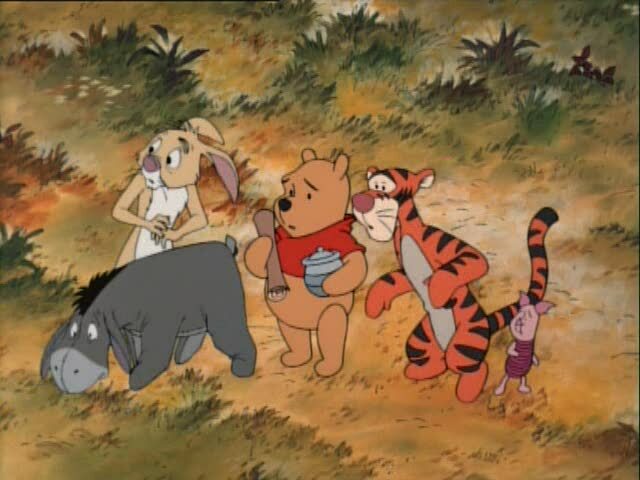 Oh, bother. But, I emerged from the other side with nothing to show for it. No Scrooge on merchandise, no collectibles, no pins on the pegs, nothing on the Cast Member pin lanyards, and nothing on their pin-trading board. It was starting to look grim. Oh well, I told myself glumly. The Scrooge Quest has to end some time. As we reentered DCA, Amy almost stepped on a multi-person FastPass for Radiator Springs Racers just lying on the ground. She picked it up and held it aloft, looking for someone to claim it, but there was nobody turning circles or patting their pockets in sight. It was a moment of either serendipity or Disney Magic®, depending on your preference, and I sent her to ride it with her sister one last time. Meanwhile, Sarah and I walked over to use FastPasses we had gathered earlier for Soarin’ Over California while Brennan went to find his dad and brothers. 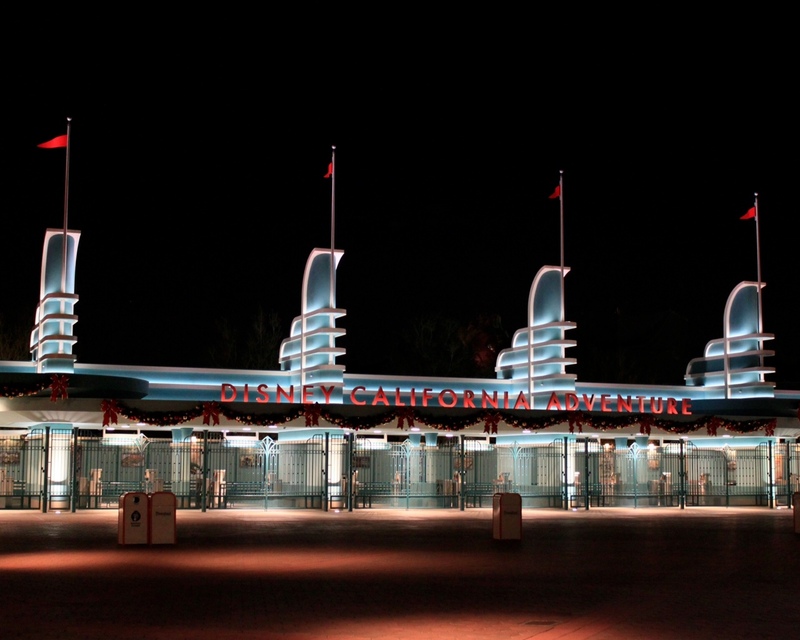 The hour was growing late, and the Duffins’ time at the Disneyland Resort was drawing to a close. In a further bit of serendipity, Sarah and I found ourselves in line just behind my mom, dad, grandma, and brother Josh, and his family. I almost stole this sign, I liked it so much (not really). It was dark with about an hour to go before World of Color when we exited Soarin’, and the Duffin family began to gather again, coming in pieces. As they found their place and settled in, I walked back up to the pastel row house facades and found a bench to rest my feet. 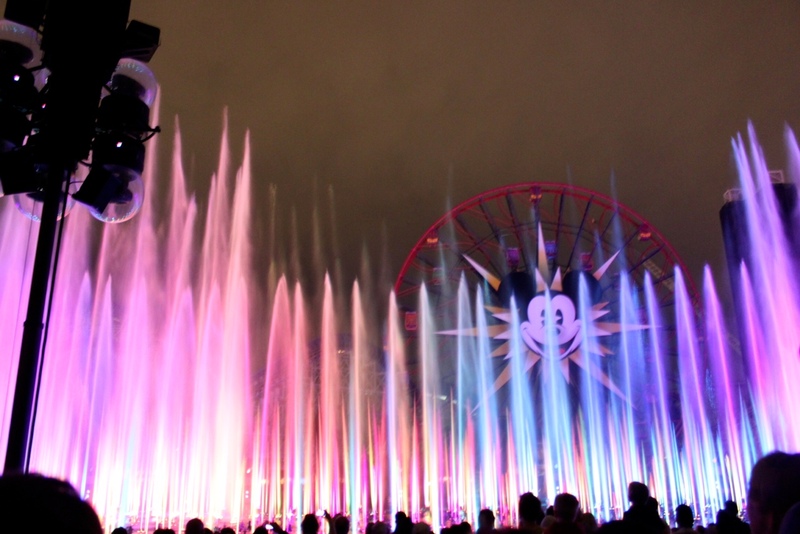 I was not deliberately avoiding World of Color, because it is amazing, even for a guy who doesn’t care for the shows. However, it was more valuable to me to rest my throbbing feet. Another decision based on Disney Marathon strategy. 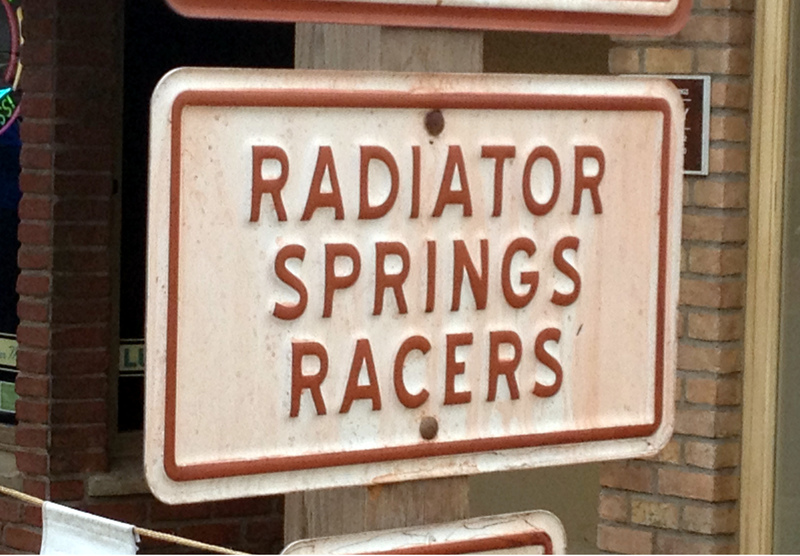 There are some great things at the Disneyland Resort, both physical and metaphysical. These are the details, the highlights, and the flashes of everyday magic that keep us spending our vacation money, praising it to non-believers, and writing about it in long, self-serving blog posts. There are counterbalances, as well; the shadowy, unpleasant, unhappy parts of the experience that are inevitable in something as large and complex as Disneyland. Most of the negative experiences at Disneyland are incidental: heavy crowds, rides closed for repair, or a Cast Member having a bad day. But other problems – the significant ones that find voice on the more thoughtful fan blogs – are organizational. These claims can be quite far-reaching, such as: Disney is not as eager to innovate with regard to developing their theme parks, or Disney has become too big and too impersonal, which stifles imagination. Boogeymen abound in these allegations, too. Disney is controlled by the accountants, the bureaucrats, the out-of-touch executives, the entitled Imagineers, the managers, the shareholders, the la-la liberals, the hardline conservatives, the public, the Annual Passholders… basically anyone but those who should be running it (which is – ask anyone – only Walt Disney, who is still on ice in a secret annex underneath the Rose Bowl, waiting for technology to catch up with medical science). Some of these are genuine concerns and some are fringe theories, so let me float my own: the biggest problem at the Disney Parks and Resorts Empire is the pursuit of elitism. The controlling hand of Disney has lost much of its regard for the average customer. My theory is reflected in a few ways. The now-annual ticket price raises speaks to a leadership team that can essentially print its own money right now. Whatever they ask us to pay, we pay, and may grumble about it, but we are not going to miss out on our Disney trip over a few extra dollars. Decisions are made to close cherished spaces, like the Disney Gallery or Court of Angels in New Orleans Square, that have sentimental value but no significant earning potential. Seasonal experiences like the Halloween parade are deployed only for the special ticket event. The common thread is money: the more you are willing to pay, the better your experience will be. The hand wringing over the Court of Angels is one of the clearest examples of this. That quiet, pretty space is not going anywhere, and will still be accessible. 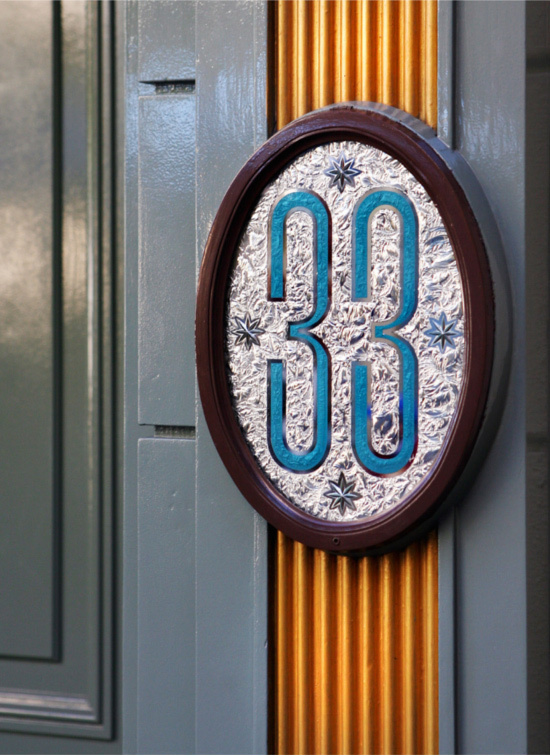 You just have to join Club 33. Get on the list, wait a couple decades, pay your tens of thousands in dues, and just like that, you have full access. The cheap seats are just as wonderful at the World of Color. When we watched World of Color the first time this trip, we had been in a special FastPass location, available only to those guests who untied their purse strings for the meal deal. The unwashed could cast their eyes on World of Color, yes, but only those who chose to buy the expensive lunch at the fancy restaurant got to watch the spectacle head-on. Even that viewing area is strictly standing, though. There were also a few benches up around the perimeter, in an even more exclusive, roped off area. I stopped a patrolling cast member to ask about the benches. I didn’t mind standing, but my parents and grandma had never seen World of Color because they do not feel up to the wait. The cast member told me that the benches were reserved for high-status guests: celebrities, executives, or people who hired a VIP Tour Guide. Curious, I looked up the VIP Tour Guide service on my phone. The distinctive red plaid vests and blue skirts/slacks of the guides were once a rare sight in the park. A typical guest saw them less often than the costumed Mickey walking down the street. Now, the guides are common, and seeing one has gone from neck-craning interest/hopeful celebrity sighting to just another rich person who doesn’t want to wait in lines. I found my evidence confirmed in black and white on the official company website. Think your park admission buys you good attention from the cast members? Think again, buddy: there is whole different paradigm of freebies, service, deference, and courtesy for those who can afford it. None of this should be a surprise to us, because the world has always worked this way. Even those – like me – who complain that Walt Disney would not approve of the move toward exclusivity miss a salient point: it was Uncle Walt who dreamed up Club 33 in the first place. He just wanted it to be kept more secret. Day eight was Friday, October 19th. My brother, Jake, and his family were waking up in their own beds. Amy’s sister, Julianne, and her family were gone, spending their last vacation day at the beach. Now, today, our friends Rich and Hydee (brother and sister) would be leaving with Matt and Wendi and their daughter, Dorothy. We had met up with Rich and Hydee the previous night, after the final bright splash of World of Color. We went with them to a late dinner at The Cheesecake Factory, escaping the Disney Resort property by a few blocks. It struck us as a good idea to begin slowly transitioning back to the world outside of the bubble, to ease the shock. But, they were all leaving later that day, Rich and Hydee and Matt and Wendi, and the group was splintering further. As we got ready for the day and I ate my Nutri-Grain bar breakfast, I surrendered to the melancholy that descends at the horizon of a much anticipated and much loved vacation. I am the sort of person who will sit in my living room several days before the trip even begins, and say things like: “Do you realize that three weeks from today we will be home and this whole thing will be over?” I can be a real barrel-of-fun sometimes. We found Rich and Hydee in Disneyland near the Hub, where they were spending their last half-day before driving halfway back to Las Vegas that night. They had been over to Space Mountain to pick up FastPasses, and were squiring Dorothy around so Matt and Wendi could run on a few rides together. Hydee surprised me with her Space Mountain FastPass so I could ride with Rich. The ladies decided to keep walking and absorbing the atmosphere while the gentlemen ran over for a quick journey into outer space. 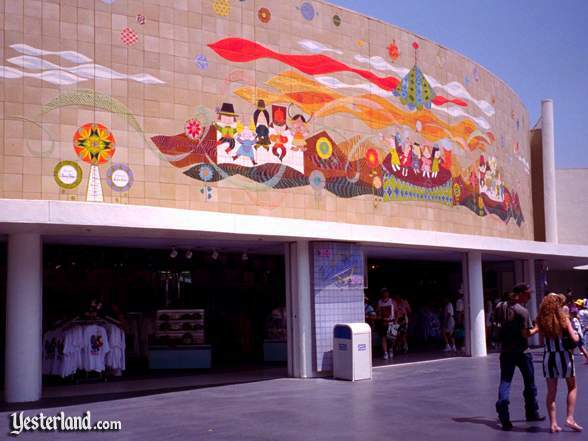 Yesterland’s photo of the Circle-Vision theater exit (note strategic placement of trash can). 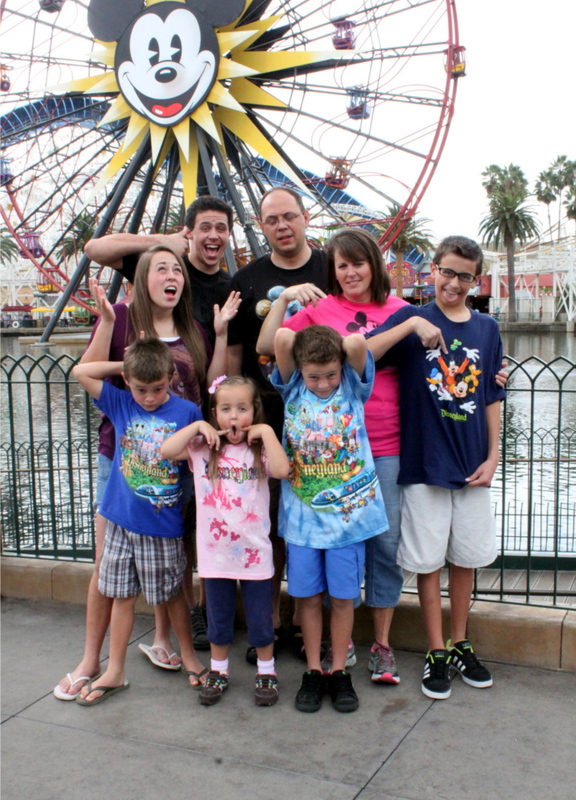 Amy used to love fast, roller-coaster rides, although now they give her motion sickness. She can negate this to a certain extent with medicine or methodology (her current preferred method are Sea-Bands), but even riding a relatively mild roller coaster will give her a headache. I have never been disturbed by fast rides in the same fashion, although attractions that went in constant circles – like the Astro Orbiter – came close. Disneyland veterans will remember when Tomorrowland had a Circle-Vision 360° theater where Buzz Lightyear Astro Blasters now stands. The one time I watched American Journeys as a foolish youth, it made me so sick that I walked out of the theater and barfed into a trash can. Anyway, the general motion of Space Mountain is circular, which had never been a problem for me in the past, and I did not even think twice about it before jumping on board. But, by the time we returned to the loading station, I was feeling a little squishier in the guts than usual. It was a disappointing symptom of… something. I tried to tell myself that the fingernails-on-the-chalkboard screeching of the Ghost Galaxy overlay (one of Disney’s Halloween themed offerings) was somehow to blame, but the truth was far scarier than any theme park ride: it was the relentless advance of middle age. The slight queasiness passed by the time we met with Amy and Hydee, but I found the specter of passing time I had dismissed from the morning was hanging around again. Why do all wonderful things have to end? Why do we grow old? Was my knee sore from long days in the park, or was it arthritis? At least I was smart enough to keep these thoughts to myself, seeing them for the foolishness they were. 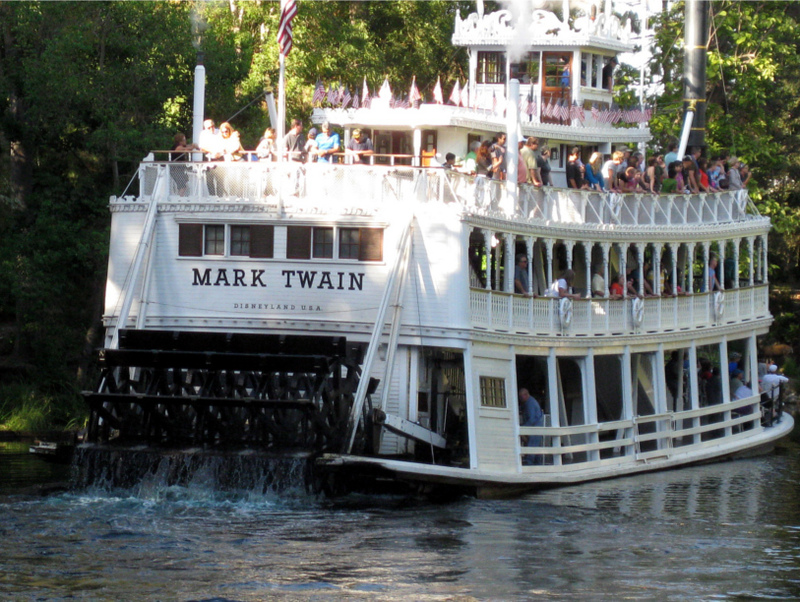 A fine day to cruise the Rivers of America. We found Amy and Hydee at a table on the top level of the Hungry Bear Restaurant, tucked in the back, overlooking the trees and the water. They were sitting with Dorothy in her stroller and sharing bites from the Hungry Bear’s signature lemon “Bumblebee” cupcake. We joined them and watched ducks fly in, saw the Mark Twain cruise slip past, and I made Dorothy laugh with my imitation of a cruise ship steam whistle (always a crowd-pleaser). Being two-years-old, Dorothy then demanded that I do it a dozen more times, and I dutifully complied. In spite of our best efforts to stretch the hours, it came time to break company with Rich and Hydee. They were taking Dorothy back to Matt and Wendi at the Carnation Café on Main Street USA, where they had a dining reservation for lunch. It was the last thing they were going to do before walking out of the gates. We had tried to talk the four of them into staying longer, and had said the same thing with the Duffins, as well, suggesting they all might extend their passes by a day. All the same, we did so while trying to keep our efforts low-key. It wasn’t that we wanted them to go, of course, but we understood that even one extra day represented a significant additional cost. Disneyland is an expensive vacation. There are cascading costs on top of cascading costs, not the least of which are the park tickets. The Disney fan community is always buzzing with strategies for saving money, or cheap ways to feed a family, or free experiences at the parks. For their part, the Walt Disney Company acknowledges their standing as arguably the premier family vacation hosts in the United States with annual price raises. Like clockwork, once the calendar is about to turn to June and the summer crowds start shuffling to Anaheim or Orlando, Disney jacks up admission. Amy and I were fortunate to purchase Annual Passports before the June 2012 raises, which bumped prices about 25% for the Deluxe Annual Passports. As of this writing, February 2014, the rates have gone up even more, and the passes we purchased for $379 a bit over two years ago now cost $499. The Premium Annual Passport, which has no blackout dates and the biggest purchasing discounts, went from $499 to $699 in the same time frame. As the prices continue to go up, one would imagine that sooner or later they would become a barrier. However, the significant increases have not slowed attendance in the slightest: Summer 2012 through the end of 2013, with the introduction of Cars Land, was, by any account, one of the busiest on record. Taken in a vacuum, this seems like a ridiculous amount of money. Amy and I used our Annual Passports for 26 days out of the 365-day period they were active, which averages out to just over $14 per day – a number that is already more palatable. By comparison, an Annual Pass to Park City Mountain Resort, one of the most popular ski resorts in Utah, costs $1,130 per person. We would need to ski a full day for 81 days of a ski season to get a similar $14-per-day value. 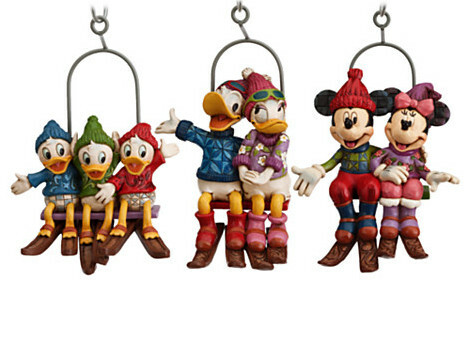 The ultimate in expensive vacations: combining skiing, Disneyland, and souvenir shopping. Further, if we suppose 10 hours a day average for each visit (a reasonable guess), then we logged 260 hours in Disneyland during that period. Were we to spend a similar amount of time seeing movies, we would take in 130 shows (at a similarly reasonable two hours per show), and at 8 dollars per ticket, that would cost $1,040 per person. Of course, the fact that we spent so much time at Disneyland last year sways all of those numbers, and does not reflect the significant additional costs of transportation, hotels, food, and merchandise. Numbers can be calculated to tell any story, but cannot change the fact that visiting Disneyland, the iconic destination known around the world, is expensive. There is nothing new under the sun. Amy and I wandered up through the merchandise locations in Frontierland: Bonanza Outfitters, Pioneer Mercantile, and Westward Ho Trading Company. Amy had her own agenda, but I was pouring over already-poured-over shelves and pegs for the Scrooge Quest. Time was running out, but there was nothing there. We continued to the Jolly Holiday Bakery Café for our lunch, which was our first trip to this new restaurant. The location – in the Hub, across from the Plaza Inn – had been used for several different things over the years, but was most often empty. The “Mary Poppins” theme was well done in small touches, and the food was different from anywhere else in the park. Amy enjoyed her turkey sandwich on Ciabatta bread, and my tomato basil soup with toasted cheese sandwich was fantastic. We transitioned over to Disney California Adventure later that day, as the Halloween party was taking place in Disneyland again in the evening. The crowds had begun to build toward the weekend again, and when we rendezvoused with Julianne later in Downtown Disney, we sat near a walkway and marveled at what seemed to be an unceasing parade of people. I wondered how many of these people were just starting their vacations, and happy. This did nothing to calm my mood. Our day ended back in DCA, where the last bits of our travel party met together at the Carthay Circle plaza on Buena Vista Street. My mom and dad, my grandma, and Josh and Stacie and their kids were tired from their own long, last day. I looked around at the tired postures and weary faces. Was this a vacation or a forced march? Why do we enjoy doing this, again? The sun is setting on another day at DCA… and our vacation. But, everyone hits a wall, and I knew that all who fight through it could earn a euphoric end. Three of our groups had already crossed the finish line, with two left to go. My parents and their group were just breasting the tape, and we had our own last day tomorrow. Was all this a little dramatic for what amounted to an expensive, wonderful vacation? 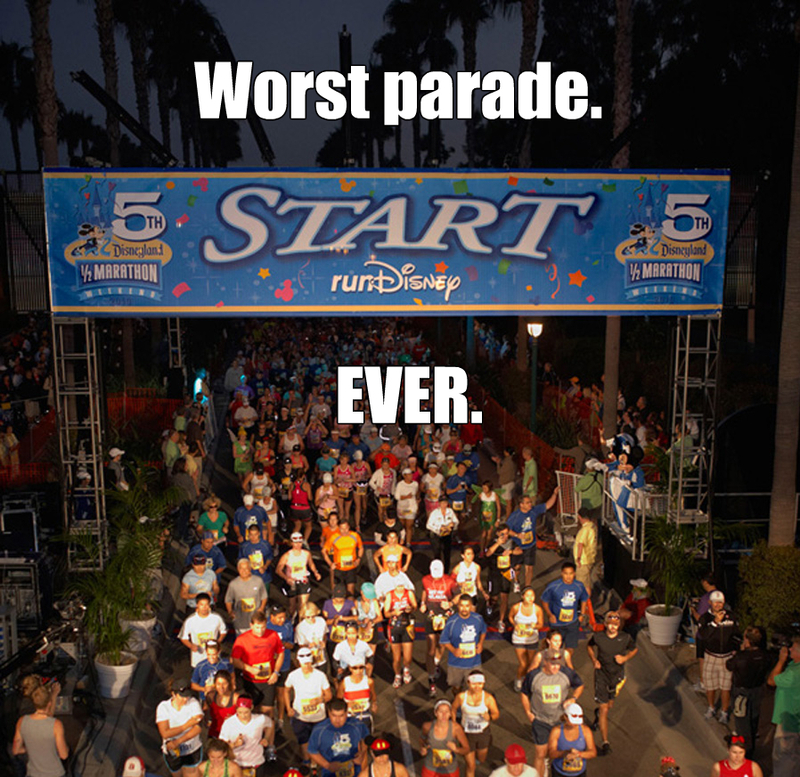 Yes, without a doubt, but we are Disneyland Marathoners. That is all part of the strategy.